One night I had randomly thought whether a rose gold nail polish shade exists and did some research on it. I had stumbled upon Essie Penny Talk which was available back in 2012 in the Mirror Metallics collection, a limited edition I believe. I ended up purchasing it on eBay for £7.95. No regrets there. The colour in the bottle doesn’t reflect what it looks like on the nails which I find is very odd. This shade is described as a copper metallic. It has lovely pink undertones and am still obsessed with anything rose gold. Edgy yet girly. I never venture out to metallic polishes as I do feel that they can look cheap but I’ve had many compliments about this shade. It compliments my skin tone very well surprisingly. One swipe and it does have great pigmentation but it can lead to a slight streaky result at times. Two coats is more than enough. It has a nice consistency, not too thin, making it easy to work with. Drying time is fast, leaving a chrome, metallic finish with a good amount of shimmer. You will need to buff your nails first ensuring the nail surface is smooth otherwise any bumps and lumps will be seen once the polish has dried. The down side is this chipping after two days with or without a topcoat. If you are able to get your hands on this, I highly recommend this if chipping doesn’t bother you. Have you tried any rose gold nail polish shades? I haven't tried any rose gold nail varnishes yet, but after seeing this post, I'm going straight to buy this Essie one! I love it! What a lovely colour, my daughter would love this. I may get it for her for christmas as a tocking filler. Such a lovely festive shade! That looks pretty! 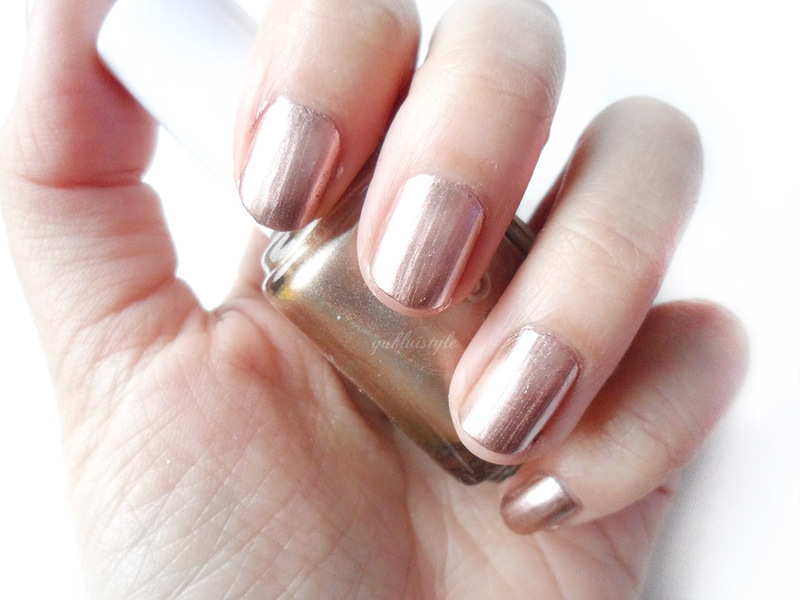 I never thought about rose gold coloured polishes until you blogged about it. Wow!! I really love the color!! Never thought about rockin' it but it looks amazing on you. It's very classy.